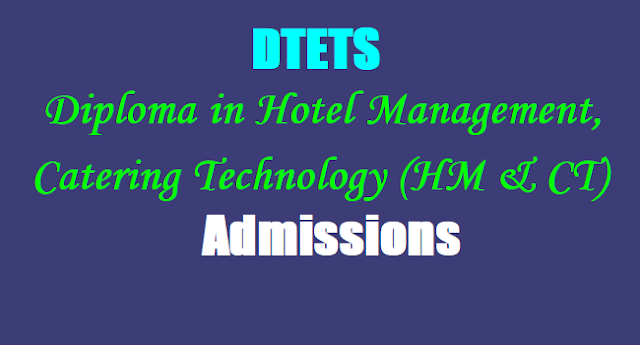 #DTETS/TS Diploma in Hotel Management, Catering Technology (HM & CT) Admissions 2018, Three Year Diploma course in #HotelManagement, #CateringTechnology(HM & CT), DTE TS HM CT Admission Notification 2018, SBTET TS Admission Notification 2018. TS Diploma in Hotel Management, Catering Technology(HM& CT) Admissions Notification 2018: Government of Telangana, Department of Technical Education has published the TS Diploma in Hotel Management, Catering Technology(HM & CT) Admissions 2018 Notification in May 2018 for admission into 3 year Diploma in Hotel Management,Catering Technology Course and applications are invited from eligible candidates from the AP State for above said courses admissions offered at the institutions under the control of the Department of Technical Education, Govt. of AP. The candidates applying for Diploma in Hotel Management & Catering Technology course should have passed Intermediate or its equivalent examination and obtained at least 35 % marks. Rule of reservations for admissions shall apply i.e., reservation of seats (85% Local: 15% Unreserved), reservation for SC/ST/BC Communities, reservation of seats for Women and reservation for Special Categories such as PH/ CAP/ NCC/ SPORTS, as per Government rules. The admissions will be made on the basis of merit as decided by the marks secured out of 1000 by the candidates in Intermediate or equivalent examination. The candidates passed in one attempt will be given first priority in deciding merit over the candidates passed in more than one attempt. In case of tie, the candidate who has scored more marks in optional /group will be given priority. The interested and eligible candidates can download the application from the website: http://dtets.cgg.gov.in. The registration fee of 330/- for the course shall be paid in the form of D.D. in favour of the “Secretary, State Board of Technical Education and Training, Telangana, Hyderabad”, payable at Hyderabad along with the filled in applications enclosing copies of SSC certificate, marks memo of Intermediate, study and caste certificates, DD for registration fee etc. The application with all the prescribed enclosures should be sent by Regd. Post or in person to the Principal of the above Polytechnic or before 08-06-2018. Incomplete applications and applications without registration fee/relevant enclosures will be rejected without any intimation. The candidates have to attend the admission counselling at their own cost on 12-06-2018 at 10.00 A.M at the Polytechnic with all original certificates and the required fees. The amount payable by the candidates towards tuition fee is Rs.3,800/-. Candidates belonging to SC/ST/BC/EBC/Minority categories are eligible for fee reimbursement subject to fulfilment of conditions stipulated in Memo.no.10537/ SW.Edn.2./2010 Dt:20-10-2012 of Social Welfare (Edn.2) Department, in case, the income of their parents is within the prescribed limit of Rs. 2,00,000/- per annum for SC / ST and Rs. 1,00,000/- for BC / EBC / Minority categories and a certificate issued by the concerned Tahsildar / M.R.O. (issued on or after 01-01-2018) only is to be produced to that effect. The candidates so admitted with fee exemption shall apply to Government for fee reimbursement and the fee reimbursement is subject to the orders by the Government from time to time. However, such candidates have to necessarily pay admission fee, syllabus book, Board recognition fee, and alumni fee (i.e., Rs 500/-). Address: Kamala Nehru Polytechnic for Women, Exhibition Grounds, M.J. Road, Nampally, Hyderabad. Date for receipt of filled-in applications: from 01.06.2018 to 08.06.2018. Date of admissions counselling: 12.06.2018. Class work shall commence from 14-06-2018.